It’s been six years since my brother’s remains were buried in Arlington National Cemetery. The above photos are only three of the many taken that day, yet just these three tell a story. I remember so well every moment of the service and funeral. It was the most grand display of honor and respect given to Capt. Herbert C Crosby, my brother, Vietnam MIA for 37 years. It’s the same honor and respect given to all the soldiers buried there, and across this nation. I look at that very flag shown above every day. It is displayed proudly in the beautiful wooden flag box engraved with his name and his medals. It sits on a shelf facing the burial flag that was given to mom at dad’s memorial service in 1991. I have dad’s flag mounted on the wall, which since it’s 9.5′ x 5′ so it makes a pretty prominent statement on the wall. I look at dad’s flag every day. They are so beautiful and give me comfort. Memorial Day, whether traditional (May 30, and always the proper day) or the observed (last Monday in May-to give everyone a long weekend for BBQs and opening day of summer fun), the day is and always will be special to me. My brother, Herby, was born on traditional Memorial Day in 1947. My dad died on observed Memorial Day in 1991. Herby was buried in Arlington National Cemetery on the Friday of Memorial Day weekend 2007. Since the funeral in 2007, I have gone to the cemetery just about every year. He is buried in Section 60, most known for the Iraqi fallen heroes, but many Vietnam soldiers are also buried there, among Korean and WWII. Every year there are more and more graves that Section 60 is almost full, if not already. I see a fresh grave every time I go. I pray one day there will be no more war, no more fresh graves. That’s a hard image to vision, but I pray anyway. 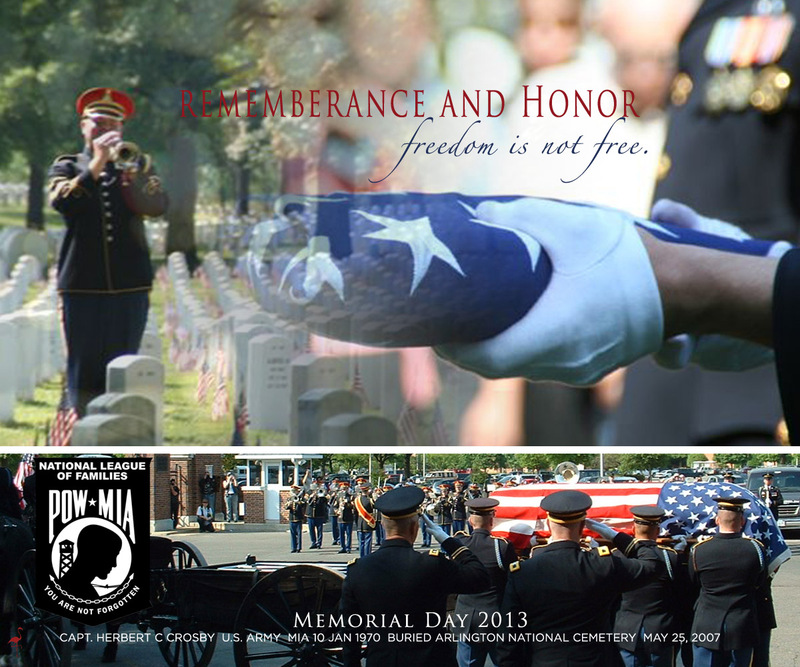 I remember, I honor and I decorate the graves of our fallen heroes this Memorial Day weekend. God bless them all and their families. I also stand tall for our soldiers left behind in all wars. They are not forgotten. This entry was posted in Capt. Crosby, Salute, Stories and tagged Capt. Herbert C Crosby, Crosby, Memorial Day, Vietnam MIA. Bookmark the permalink.